In visible light, the star-forming cloud catalogued as NGC 281 in the constellation of Cassiopeia appears to be chomping through the cosmos, earning it the nickname the "Pacman" nebula after the famous Pac-Man video game of the 1980s. Wokkawokkawokka … chomp! A new view of the "Pacman" nebula reveals a gaping mouth and a set of sharp-looking teeth taking a bite out of space. The Pacman nebula is a giant cloud of dust and gas located approximately 9,200 light-years away within our own Milky Way galaxy. It's official name is NGC 281, but the nebula earned a more popular nickname because of its resemblance to the character from the hugely popular Pac-Man video game that was first released in 1980. When the nebula is viewed through visible-light telescopes, the large star-forming cloud appears to be chomping its way through the cosmos, NASA scientists said in a statement. When seen in infrared light, however, the nebula takes on a different appearance, with a large set of lower teeth giving it a much more threatening look. The new image was taken by NASA's Wide-field Infrared Survey Explorer, or WISE, a sky-mapping observatory before it completed its mission in February 2011. The Pacman nebula measures about 130 light-years across and contains a cluster of baby stars. This young cluster, called IC 1590, can be seen as a group of stars near the center of the red and green cloud in the upper portion of this new image. The cluster contains several massive stars, each many times the mass of the sun. These stars are also extremely hot and produce large amounts of ultraviolet radiation. The radiation and the strong stellar winds erode the larger cloud from the inside out, which gives the nebula its shell-like appearance and Pacman's "teeth" as seen in infrared light. 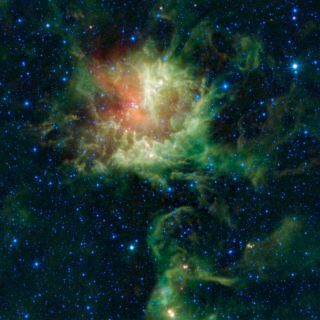 The wind and radiation also heat the dust in the cloud,making it glow brightly in infrared wavelengths. The red dots that appear to be sprinkled throughout the image are thought to be the nebula's youngest stars that are still forming within cocoons of dust.